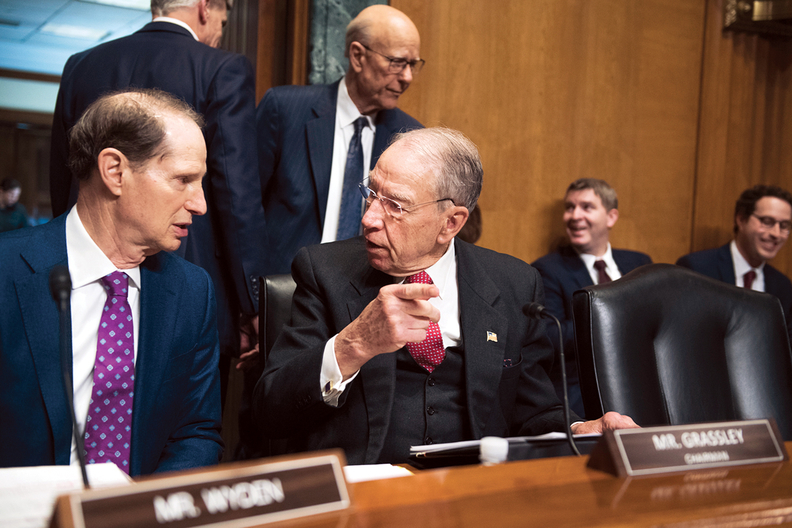 Chairman Chuck Grassley, R-Iowa, right, and ranking member Sen. Ron Wyden, D-Ore.
A Senate Finance Committee hearing on Tuesday signaled a softer take than the Trump administration when it comes to regulating pharmacy benefit managers and their role in the drug supply chain. Lawmakers questioning executives of five major PBMs showed waning enthusiasm for HHS' proposed ban on PBM rebates within Medicare Part D.
Senators focused their criticisms on the system's opaqueness and urged more transparency, steering clear of proposals to expand the Trump administration's proposed rule to the commercial sector. In a high-profile February hearing, pharmaceutical CEOs threw their support behind the proposed HHS rule, although only two committed to lowering their list prices if Congress extended the PBM limits to the commercial market. Tuesday's hearing followed up by bringing together the executives of Cigna, CVS Health and CVS CareMark, Humana, OptumRx and Prime Therapeutics. Finance Committee Chair Chuck Grassley (R-Iowa) defended the PBMs' role in negotiating prices as set forward in the Medicare Part D program that he helped create. "This system of private entities negotiating is what I envisioned as an author of the Part D program," Grassley said. "I still believe this is absolutely the right approach. I oppose any effort to undo the 'non-interference clause' currently in statute." The panel's ranking member, Ron Wyden (D-Ore.), took a harder line from the Democratic side, condemning the secrecy in the system and the incentives that lead to PBMs pushing higher list price drugs to get higher rebates. He brought a copy of a prior-authorization form that CVS required physicians to fill out if they wanted to shift a patient from a high-cost Amgen cholesterol drug to a cheaper version from the same manufacturer. Derica Rice, executive vice president of CVS Health and president of CVS Caremark, argued that the company is looking at the net cost to the patient after rebates and discounts when it decides on patient medication. Wyden called the position the "prime example of our broken drug system favoring the big corporations rather than patients." "I hear your answer, and it looks like me that you all are taking deliberate actions to pad your bottom lines at the expense of patients," he said. Sen. John Cornyn (R-Texas), who is co-leading a bill on transparency for PBMs, took a similar tack as he tried to figure out how PBMs use the contracting system to their own benefit. But few executives conceded much in the exchange. Only OptumRx CEO John Prince said that his company sets rebates as a percentage of list prices or requires manufacturers to give advance notice if they're lowering their list prices. No one on the panel said his company penalized manufacturers for lowering drug list prices. Most said they don't know if their PBMs require drugmakers to keep paying the same rebate even if they reduce their list price. Cigna Chief Clinical Officer Dr. Steve Miller said his company requires manufacturers to keep paying the rebate until the contract is renegotiated, and Prince said the requirement is only in place for Part D.
Cornyn warned the CEOs he will ask them to disclose in writing the total dollar amount they receive from drug companies through rebates and fees, as well as the total amount they send on to their health plans. The hearing took place one day after the public comment period closed for HHS' proposed rule. Insurers and hospitals all weighed in, calling for tougher requirements on drugmakers. They warn the rule likely won't lead to lower list prices without a mandate on manufacturers. Leading House Democrats are also increasingly critical of the proposed rule. On Monday night Wyden released the pharmaceutical executives' written responses to his questions for the record, where they remained largely noncommittal about promises to lower prices in case Congress changes the entire rebate system. Last week, amid insurer warnings that they would raise Part D premiums if the rule gets finalized as proposed, the CMS offered a two-year financial buffer from the federal government for plans if they are afraid of losing money.